Here is the title track from Solid Air (live in Dublin). "Why such grudging praise for Sebastian Barry at the Costa Book Awards? What to do with Facebook friend requests from people one doesn't know? Perhaps the best idea is to put it to The Lord and wait for an answer. If you haven't had a twitter from The Lord in ten minutes, please reset your rotary mower and try again. Unfortunately Lord Rotor cannot enter into any correspondence about the results of prayers, due to the overwhelming number of submissions. Bless you all and bless the Willesden Rotary Mower Club. The proposal: From April 1st 2009, no further licence fee subscriptions to be paid to the BBC. The BBC receives approximately two billion pounds extorted from every family in the country, with the exception of the extremely elderly, regardless of ability to pay. It is a poll tax. Additionally the BBC has now proved that it is not representative of public opinion and is used as a tool of the craven government's corrupt foreign policy. As a result it is literally covering up, hiding the humanitarian disaster in Gaza, purely because it is beholden to the government and Israel for its luxuriant position embedded and dependent utterly in and on the status quo. The interests of the British public and the world on the other hand, depend on the dismantling of the status quo and on progressive policies. If we all sign up to boycott starting from April 1st, we will have strength in numbers. Meanwhile the prospect of bankruptcy can concentrate the minds of the grovelling, backsliding sluggards who run the corporation. Stop the slaughter. Stop the wars. Nearest station Willesden Green. Buses 52, 98, 260, 266, 302, 460. Free parking behind Library Centre. Fully accessible. 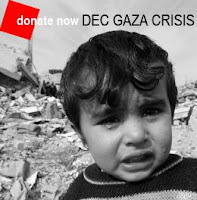 Donate Now to the DEC Gaza Crisis Appeal. Willesden Herald has donated £25 by the way (our horse came in)*. Only telling to encourage our readers to match it, not looking for any plaudits. [Whispers] The schools are demolished? (Check.) The kids are dead? (Check.) Ok, ceasefire. Hold your phosphorous. Our strength is established - and more! [Shouts] "Help! Don't let them get weapons! Help! Gordon Brown!? United Nations?! Help!" Police cordoned off demonstrators on the Terminal 5 departures floor. "Give me time to realise my crime" - 15 months enough? The perils of cocaine-induced paranoia. But fifteen months for this when thugs walk free every day for worse? For example, if you were one of the Leeds footballers who kicked an Asian youth almost to death outside a nightclub, you might walk free to continue your lucrative career in the beautiful disgusting, spit-soaked game. The music is part of "Adios" by Kickland and Wood. Sorry about the abrupt ending. I really think he's overdone himself this time, he's exceeded himself, if it were even possible for such a thing as what I just said. Listen how his masterclass on crime writing takes the audience from nought to asphyxia in about 20 seconds. He reminds me very much of the great Seán McGobaloon, raconteur and co-founder of the Bunch of Grapes Theatre together with the legendary Wilton Hardwicke. There is a burst water main at Willesden High Road in front of the Library Centre. It's blocking a busy and awkward tee junction. There were stop/go people letting traffic from three directions pass on one side of the traffic island tonight. Severe delays are likely in this area. "Celebrate the inauguration of America’s first black president at the Tricycle. On January 20th we will be screening the inauguration ceremony live in the cinema with American beer, pretzels and cheerleaders completing the party. Event takes place 4.30-8pm. Tickets £16/£15, all proceeds to the Tricycle Education Programme. Now open for booking." The moon looks smaller in the pictures than in reality. Something heavy hit and broke a huge wind turbine, but nobody knows what. The Telegraph has more details, including links to sightings by locals. We're busy reading the entries, 645, for which many thanks. It is taking a long time but it is going well. January is slipping by and at the present rate it looks as if the results will only be known about the end of February. Barring unforeseen events we are hoping to announce the winner at an event in London on March 9th, and we are hoping to have the judge with us for that (yay!) but please don't consider this confirmed yet. Announcements will be posted here when details become available. I know it's a long-ish wait, but I think it's better to keep you informed about what's happening. There are even longer waits for results in other short story competitions, as my bitten fingernails will testify. With one of the most dreadful pictures I have ever seen. It shows the law of the conservation of beauty, no matter how much you try to destroy it, it cannot be made into anything other than beauty. The destruction marks the destroyer, it never marks the victim. And medical help was denied access for several days, till they arrived to find dying children waiting beside dead parents. The great democracy! Searches: The W.H. now has joined forces with Blogger to enable you to search the nearly 2,000 articles here so far, and show the actual articles together on the page - not a Google link list like it used to produce. Labels: Nearly everything has now been labelled as well, so you can click on a label and likewise get the selected articles together on one page. If you click on the link for my name below, for example, you should see all the articles with my byline. Comments: There are still some problems with the links to comments in the old format, which we're trying to fix. Moderation is now turned on for comments on posts older than ten days. For the avoidance of all tedium, comments are only enabled on new articles in a lighter vein. Mergers: Most of Ossian's and Zoz's posts from their other blogs have now been imported and merged into the W.H. posts in date sequence by using the new Blogger import and export utilities. All of the imported posts are signed Zoz or Ossian and labelled Zozimus or Sloe Wine respectively. Known problems: When viewing archives, search results or label results, the side archive links do not work. The earliest posts did not have headings and so the spacing looks different on them. There is strange additional spacing on some of the imported posts as well. UN spokesman: "Israel has briefed us that there were no mortars fired from the school." Now comes the strategic guilt trip instead of the initial lies. This follows a pattern. Soon some portentous creep will pop up intoning that there will be a full inquiry. You know how they have to always try and find out afterwards what it was they were doing at any given time: it's never known until there's an inquiry. So why do they do shell schools and other civilian targets when they never know what they're doing, apparently? The fact is they know exactly what they're doing. The disappearing book: After a page has been read it fades to blank from exposure to light. At the end you're left with a handy notebook. Toothpaste dispenser: All the cost of toothpaste is in the packaging. Get a cheap refill and put it in our handy wall-mounted or free-standing dispenser. Simply press the big lever to dispense directly onto your toothbrush. No more arguments about who squeezes the tube in the middle! Plus you save money and help the environment. Biodegradable poopscoopers: This is basically a special cardboard and lined paper bag with its own built-in handles to operate like a plastic poopscooper but you pop the entire thing into the dog waste bin and it is handier and better for the environment. If you've ever had to fiddle with those dreadful plastic bags that take an age to open and place into those special plastic contraptions, especially if you have two dogs or more to walk, you'll know what a royal pain it can be. Now you can simply take the next self-contained impervious cardboard and paper ready-made scoops, which are shaped and behave just like the plastic ones, and you're not only saving time but switching to biodegradable containers. The paper mechanism for "turning inside out" such that the hands are protected and the container sealed would be refined and worked out so that the thing snaps over and seals itself. There are millions to be made from any new application for paper, I believe, as there is a limitless supply of cheap material that can be resold expensively if only more applications can be discovered. So kindly send me an ex-gratia payment if you become the next Percy Cats'-Eyes wozname, from any of these. I still haven't had anything after suggesting "Chilli Non Carne" to Linda McCartney Foods, they just used it and never even replied (true). A brief survey of the short story | Books | guardian.co.uk: "Chris Power looks at masters of the short story through the ages"
Part 13 on Franz Kafka today. I've only just found this and it's already on part thirteen. Part 1 was Anton Chekhov, appropriately. The series also covers some contemporary writers. How ludicrous that tenets of philosophy, or science for that anti-matter, should be promoted like suntan lotion with slogans on the sides of buses. Will some cabal of Cartesians and followers of Pascal get together to sponsor posters with "I think therefore I am and I'm putting my shirt on God" for the sides of other buses. Will the Vatican bankroll a campaign to promulgate little mottoes formerly confined to small posters on church noticeboards. Will climate change enthusiasts and opponents sponsor slogans on buses that say, "It's not overheating. 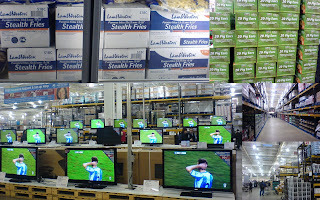 Chill out, now just enjoy life" or "We're all going to fry. It's too late. You are to blame." There are dozens of people being killed on the streets of England by gangs armed with guns and knives. Over 20 young people killed by knives alone in London in 2008. No country on earth would tolerate this daily risk to its people, 7 million Londoners in range of these deadly weapons and almost one a week being killed. We know where these armed gangs live. Please IDF, come and bomb Southwark, Lambeth, Hackney, Harlesden and Willesden for starters, then parts of Manchester, Liverpool etc. We need your help here, if you wouldn't mind, after you've flattened Gaza. Let's start by robo-phoning everyone in Brixton (have to start somewhere) and telling them that homes with knives and guns will be hit by missile strikes and artillery fire. Playgrounds, high streets, marketplaces, pubs and hospitals from where these killings have originated must be destroyed. Of course we know which places store the weapons - it's the schools, the clubs, the churches, the blocks of flats. We think we know the individual flats in the estates from where these armed gangs operate. But let's robo-phone everyone anyway, so nobody can say they were not warned. We can pound Brixton from the air for say five days, before bombarding it with artillery and sending in the tanks and bulldozers. Let's not stop till the scourge of knife and gun killings is eradicated. No country on earth would stand for this. An hour of short stories a month in the comfort of a London coffee-house – what more could you ask for? In the first of this event series Pulp Net presents: award-winning short story author Helen Simpson, story writer and debut novelist Chris Killen, Costa writer-in-residence Davey Spens and Willesden’s finest, Stephen Moran. Run time: 7.30pm – 8.30pm. A suggested donation on the door of £3 is requested towards running costs. Note: Places are limited to 40, assigned on a first-come first-served basis from 7.15pm. Publishing typhoon Red Woodward announces incorporation of the struggling Zozimus journal into the Willesden Herald. Zoz has been providing cartoons for the Herald for some time. Ossian's supposedly literary posts from Sloe Wine are moving in here as well to simplify things further. (Saturday 27 December)...Later I am at home with my family. We've just received a phone call on our land line. It's the Israeli defence ministry, and they say that any house that has guns or weapons will be targeted next, without warning and without any announcement. Just to let you know, we don't have any weapons in our house. If we die please defend my family. (Sunday 28 December) I wake up at 7am after an Israeli F-16 attack. Our house is shaking. We all try to imagine what has happened, but we want to at least know where the attack was. It is so scary. We try to open the main door to our flat, but it's stuck shut after the attack. I have to climb out of the window to leave the house. I am shocked when I find out our neighbour's pharmacy was the target. It is just 60 metres from our house. They targeted a pharmacy. I still can't believe it. Not "criticism" please:- constructive but rigorous feedback, I think you mean.